We’ve all seen the photo. Lyndon B. Johnson takes the oath of office on Air Force One shortly after President Kennedy’s assassination. Jacqueline Kennedy, the suddenly former First Lady and new widow, stands to his left, shell-shocked. The still image shows trauma and grief, but also defiance, as she stands in the pink suit stained with her husband’s blood. “Let them see what they’ve done,” Jackie said famously. Pablo Larraín’s Jackie expertly captures that sorrow and strength, in the impromptu inauguration and throughout, elegantly balancing events and emotions in the aftermath of tragedy. It’s a towering achievement in understatement, never becoming too preachy or too caught up in details that would detract from the private grieving process of a very public woman. 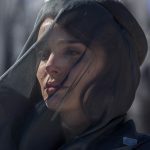 Natalie Portman displays the mix of Jackie Kennedy’s grace and fragility beautifully, putting on a stoic public face that hides, yet hints at, the pain. When alone, the suffering becomes more apparent, though private moments are never used for flamboyant displays of acting. Portman’s name will be called often during awards season, and deservedly so as she gives one of the best performances of the year. She nails the intonation and characteristics of the famous First Lady without them ever feeling like imitation. The actress, and the film, also don’t shy away from Jackie’s more deliberate actions following her husband’s death. She quizzes the hearse driver about James A. Garfield, William McKinley, and Abraham Lincoln to prove a point about legacy. She models JFK’s funeral procession after Lincoln’s. 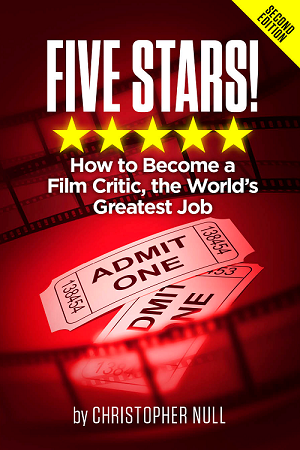 Also calculated is her interview with a journalist (Billy Crudup) who’s never named, though is obviously modeled after Theodore H. White. His Life magazine article perpetuated the Camelot myth of the Kennedy White House. The interview would seem like a convenient biopic screenplay gimmick if it weren’t such an effective real-life contrivance as well. 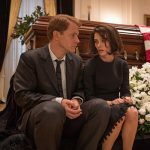 Their quietly contentious conversation, in which Jackie occasionally goes into gritty detail that she won’t allowed to be printed, is intermingled with scenes of that fateful day in Dallas, funeral preparations, difficult moments with her kids, and moving from the White House. Noah Oppenheim’s script skillfully jumps between the interview and the flashbacks. Many of the most powerful moments are ones we’d never think of. There’s a quiet scene where all that can be heard are ambient sounds of workers packing up the Oval Office. Immaculate period ornamentation, from the sets to the costumes, give off an undeniable early-60s vibe, and re-creations of archival footage add to the aesthetic. Jackie’s televised White House Tour is wonderfully reconstructed, both technically and thematically. The grainy black-and-white video is complete with audio sync issues, while the artifice of Jackie’s broad smile is made apparent by Portman’s affected cadence. Outside of the TV production, Larraín frames Jackie in the middle of ornate White House embellishments, often in three-quarter shot with plenty of space above her head to suggest the malaise hovering over. The supporting cast is solid, also helping to convey the chaos of the historical moment on a very human level. Peter Sarsgaard is fantastic as Bobby Kennedy, shaken yet also lucid enough to protect Jackie from those who disagree with her plans for his brother’s interment. John Carroll Lynch and Beth Grant as LBJ and Lady Bird Johnson only have a couple of scenes, but their detachment from sentiment is an important juxtaposition. Perhaps appropriately, though somewhat coldly, they’re focused on moving forward while Jackie is in turmoil. John Hurt’s modest, compassionate priest is a perfect soundboard for Jackie to work through various stages of grief. Intensifying the circumstance is the hypnotic score from Mica Levi, which is haunting in a different way than her brilliant work for Under the Skin. The opening notes create the sensation of upheaval, and occasionally discordant tones reflect disorder. The funeral almost feels like a horror movie. 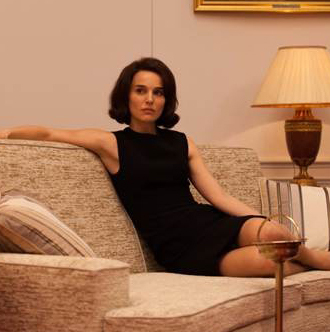 Within all of the unrest, the focus of Jackie never leaves its subject to concentrate on grand philosophies. Her state of being, driven home by a remarkable performance, is more than enough to carry the overwhelming dramatic weight. No grassy knolls or magic bullets are required.